A) Alan, over the years, I’ve heard others describe the post-spawn period as a time when fish go into a funk, becoming inactive and lethargic, supposedly as they recover from the rigors of spawning. Gaining a thorough personal understanding about “post spawn” walleye behavior has been tricky for me because like most Minnesotan’s, I’ve rarely had the opportunity to experience fishing for walleye during, or immediately after the time that they actually are spawning. I used the term “rarely” because on certain rare occasions, Mother Nature has delivered spring weather late enough to force walleye spawning to coincide with the Minnesota Walleye fishing opener. 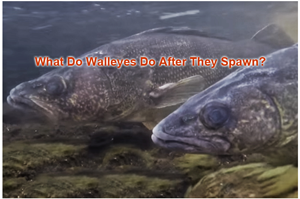 Because of my own personal experiences during those rare, late spawning runs, I do have some ideas of my own about walleye behavior during and after the spawn. But I really wanted to get this answer right, so I’ve done some careful fact checking, reaching out to anyone who knows about walleye biology who will talk to me. Along the way, I’ve discovered that there are precious few people who really know for sure what walleyes do after they spawn. And some the ones who do aren’t very good at returning my calls. But since you asked me for my thoughts, let’s start with this; I do not believe that walleyes actually go into a “post spawn funk”. I believe that we anglers simply lose track of where they are for a period of time after they spawn. On Cutfoot Sioux for example, large numbers of post spawn, female walleyes are frequently caught as they migrate into Big Winnie. From what I’ve experienced, these fish are usually super hungry and feed aggressively. During most seasons though, they have already moved away from Cutfoot by the time the fishing season opens. A tagging study conducted on Cutfoot Sioux and Winnibigoshish in the mid 1970’s appears to support my assertion. According to Large Lake Specialist, Gerry Albert, female walleyes that were tracked during that study moved fast and far away from spawning territory almost immediately after they finished dropping eggs. Albert; “Walleye were tagged in the Third River, Cut Foot spawn take, and juveniles were tagged during the summer from Winnie. Long story short – walleye tagged at Cut Foot were later caught at the Third River, those tagged at the Third River were later caught at Cut Foot, but the largest portion of fish tagged at either station were never seen again. Far too many fish went missing to be caused by natural and angler mortality so the assumption was that they were spawning elsewhere in the lake. Tags were returned by anglers throughout 3 fishing seasons and the location of harvest was recorded. Movement was as expected, along the north and east shores for some and then to the mid-lake bars for others. The furthest a walleye was harvested away from Winnie was a fish that was caught in Turtle River Lake. That fish traveled up the Mississippi River, over Knutson Dam, through Cass and Kitchi Lakes, up the Turtle River and finally to Turtle Lake. A telemetry study conducted by the Wisconsin DNR in 2011, 2012 and 2013 showed similar results. In that study, fish were tracked electronically over a 3 year period. 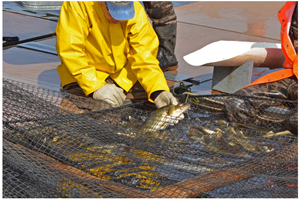 I caught up with MN DNR Regional Fisheries Manager, Neil Vanderbosch and passed along your question about whether handling the fish at egg harvest stations produces additional stress on the fish. Anecdotally, I’ve witnessed the egg harvest at Little Cutfoot many times and in my opinion, the fish have been handled very carefully. In fact the treatment they receive there is a lot gentler than the way I’ve seen many anglers handle them during the catch and release process. Summing it up, I think the term “post spawn” means something different every year. 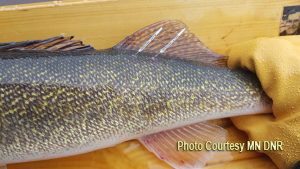 Weather, water temperature, water levels and food supplies all influence walleye behavior and nature rarely produces the same conditions two seasons in a row. Rather than walleyes going into a funk, I think it’s far more likely that they skedaddle faster than we can keep up to them. As the season progresses, habitat and food supplies have a stabilizing influence and that’s what makes fish easier for us to locate and catch. Any time they make a move and we can’t find them, we blame it on something; weather, traffic, the moon … whatever. One thing I know for sure is that there is always somebody who finds them and when they do, they usually catch some of them. So for me, I’ll have to say that I don't think that idea of walleyes going into a funk during post spawn is a very big deal. I really don't believe that they're getting stressed out during the egg harvests either. I think that when we can't figure 'em out, it's really just a matter of us spending more time searching for them. Jeff Sundin is a full time fishing guide, outdoor writer, photographer and developer of custom web content. Sundin currently serves as a volunteer on the Panfish Workgroup, an advisory committee of the Minnesota DNR. Learn about guided fishing trips and more, click here "About Jeff Sundin". Helping your fellow fishermen and women stay abreast of the fishing conditions in your area is good for everyone and it's easier than you think! Fishing Reports Minnesota is the Facebook counterpart to this page and it's open to the public. Be like me, become a duly deputized "Cub Reporter" and post your own pics and comments. If it's good for fishing, then it's Good For Everybody!